In one of my previous posts about the 3 part problem based lesson, I referred to the third part (reflect and connect) as the most important part of the math lesson since the learning comes from the student work. Students are given the opportunity to explain their math thinking, pose questions, defend their ideas, and make connections with other solutions. The teacher is the facilitator of the discussion as well as a participant. The learning comes from the math community. The following article describes three approaches to the Reflect and Connect: 1)Math Congress, 2) Bansho, and 3) Gallery Walk. In this post, I wanted to focus on the gallery walk because to be honest, this is an approach that I don’t use very often when consolidating a math lesson. This is an approach that requires a lot of movement of students in the classroom and could possibly take some time and good management skills to facilitate. In most gallery walks, student solutions are posted around the classroom, and students circulate with sticky notes writing down questions and comments and placing it on the solutions. The idea is for students to read the comments and questions on the stickies about their own group’s solutions and use that feedback to help them prepare the explanations of their work to the class. Problems can arise if students aren’t given enough “wait” time to think of questions or comments to write down on their sticky notes. This can result in comments like, “You spelled multiply wrong.” or “I like how you used the colour red to write your solution.” The goal is to promote higher order thinking and questioning but if students aren’t familiar with a gallery walk or need more time to reflect on the student solutions then perhaps an online gallery walk could be a worthwhile alternative. Lino it is a great web application that provides you with an online canvas and allows you to post online stickies, pictures, videos, and attachments. You can also share your online canvas with others by sharing its URL. Sharing the URL would allow others to post stickies as well. You can probably see how Lino it could be used to conduct an online gallery walk. 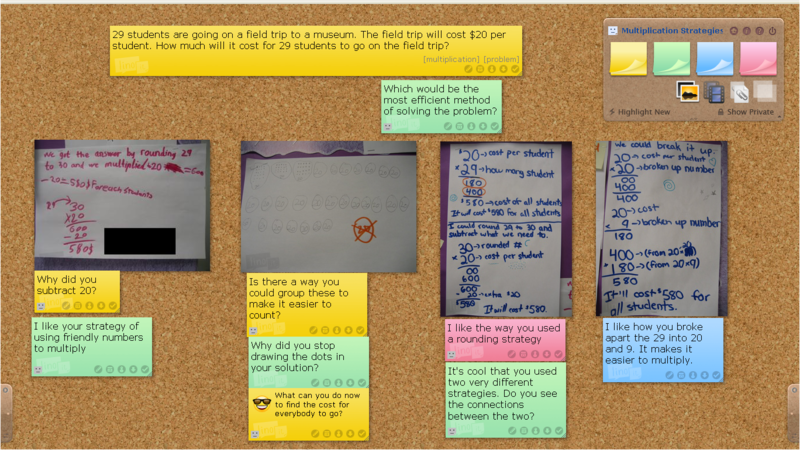 To give you an idea of what it could look like, I inserted an screenshot of an online canvas with pictures of four multiplication solutions and stickies with questions and comments posted around them. The comments/questions were generated by a team of math facilitators when I shared the link with them, which should also give you a good idea of how Lino it could be used for teacher moderation of student work. By using an online gallery walk, students could post their comments/questions in class or at home and have time to reflect on student work and pose thoughtful questions and comments. Groups could review the feedback the next day and prepare the presentation of their solution to the class. I would love to hear your thoughts about this alternative approach to communicating in the classroom. Hi Thomas, I love this idea. As a math coach I often feel teachers’ frustration at having to rush through lessons so they can ‘cover the curriculum’ when tied to rather inflexible schedules. The wait time for students to both write higher order responses and to reflect on their own work before presenting is a great benefit of using an online tool such as Lino it. I also think it opens opportunities for some of our small schools to easily join a math community and expand student exposure to strategies from a broader group. I really appreciate the sample stickies that your team created for us. We are doing some professional learning around Gallery Walk at our board over the next two weeks and your blog is one of the resources my partner and I will be sharing with teachers and administrators. Thank you! I am completing a Master module in technology enhanced learning. I would like to look at technology such as linoit, but I am struggling to find any research. Do you have any ideas?